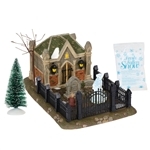 This latest addition to the Dickens Village Series was inspired by the life of Charles Dickens himself. When Charles was young, his father had to spend time in the Marshalsea Debtors’ Prison for bills gone unpaid. Hand-numbered, limited edition of 2018.